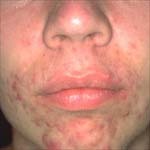 Acne usually begins at puberty and may continue for many years. Teenagers get acne as the body matures and produces hormones that stimulate the sebaceous (oil producing) skin glands to make more sebum, or oil. Sebum lubricates the skin. Sebaceous glands within the hair follicles, or pores, become plugged when oil secretion occurs faster than the oil and skin cells can exit the pores. Sometimes the plug causes the wall of the pore to rupture causing redness, swelling, and pus - in other words a pimple. Plugged oil glands may form blackheads and whiteheads. Blackheads are not caused by dirt; rather there is a bacteria that normally lives on the skin and thrives on the sebum produced by oil glands. Sometimes, this bacteria multiplies and causes inflammation and acne. Acne is built into your genes; it runs in families. In women, acne frequently worsens at the time of menstruation. Your cosmetics should be labeled "oil-free," or "noncomedogenic". Adult women often have trouble with acne through middle age. The reason is unknown although hormones play some role. Acne cannot be completely prevented. Although, a careful skin care regimen can help to lessen it's severity and the formation of new pimples. Do not scrub your face with a harsh washcloth or sponge. Scrubbing may actually make it worse by irritating the skin. Try gentle cleansing with your hands. Don't squeeze, scratch, or pick the lesions. This can leave tiny, permanent scars on your face. Prescription treatments are recommended and may take one to two months to see improvement. Medications include Topical Antibiotics, benzoyl peroxide, and vitamin A derivatives. Topical medications are sometimes used in combination with antibiotics for optimal results. Acne programs are personally formulated by Dr. Sexton for your particular case of acne. Since most cases do vary and the degree of involvement does change, your program will be modified from time to time. Continued progress depends on making regular evaluations and changes when necessary. Control of acne is an ongoing day-to-day process, and an effective program requires good communication between you and Dr. Sexton.